For other uses, see Cabinda (disambiguation). Cabinda also produces hardwoods, coffee, cacao, rubber, and palm oil products; however, petroleum production accounts for most of Cabinda's domestic product. Cabinda produces 700,000 barrels (110,000 m3) of crude oil per day.[when?] Cabinda Oil is associated with Sonangol, Agip Angola Lda (41%), Chevron (39.2%), Total (10%) and Eni (9.8%). ^ "Cabinda: Governor fires and appoints new officials". Agência Angola Press. 5 May 2016. Retrieved 8 February 2017. ^ "Histórico dos Governadores" (in Portuguese). cabinda.gov.ao. Retrieved 3 March 2019. 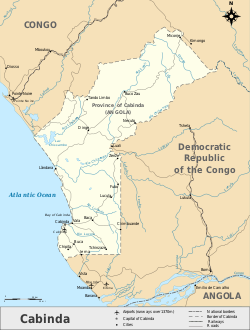 Wikimedia Commons has media related to Cabinda.